This past weekend I received an email from Emmaline Bags with a coupon (WALLET20) for 20% off of her fabulous “The Necessary Clutch Wallet“, so I bought it, and today I made it! It’s an interesting patten, a nice challenge but not overly difficult, I really enjoyed making this clutch. I was able to cut all the pieces, interfacing and complete the project is less than a day. I decided to use Jeni Baker’s Color Me Retro fabric, it’s a great summer print. 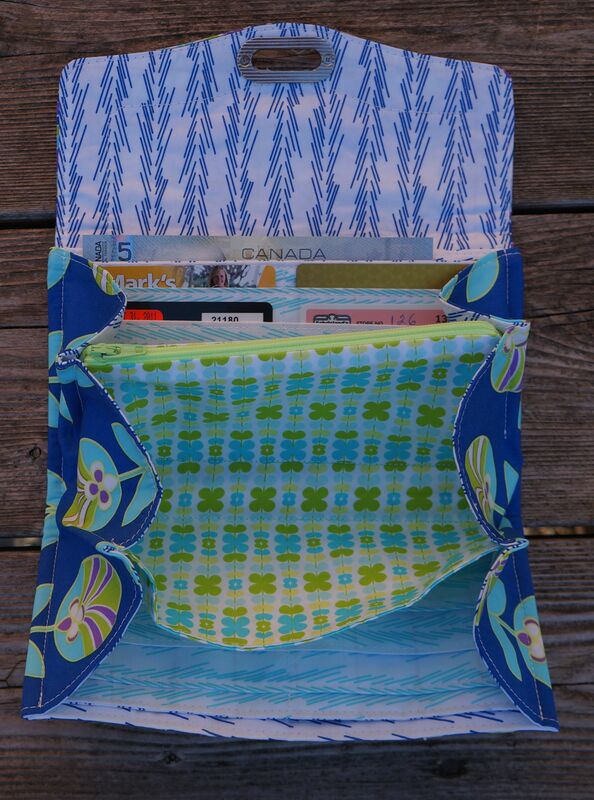 There’s a ton of room in this clutch for everything including your smart phone. I’d like to add another zippy pouch and wrist loop to this pattern. I have a few bag patterns I’d like to make this week. What are you up to? This entry was posted in Fabric, Finished Objects, Handbags and tagged Color Me Retro, Emmaline Bags, Jenni Baker, The Necessary Clutch Wallet by Tabatha. Bookmark the permalink. Very cute. I haven’t made a bag or wallet yet. I think it intimidates me a bit. Maybe someday…. A girl can hope, right? If you want to try a simple project, try one of Michelle Patterns bags (icon on my side bar), her instructions are excellent and she has a number of simple patterns which will build your bag building confidence! Good luck!! Thanks Jeanne-Mariel, I’m not quite sure about the hardware, the screws are very short and I’m afraid they’ll fall out over time. I may add glue to ensure it doesn’t fall apart!! Looks great, I have to order mine. I don’t think I will get it done that fast. Thanks Natalie, it’s an interesting pattern, I have a lot of fun working on this, hope you do too! 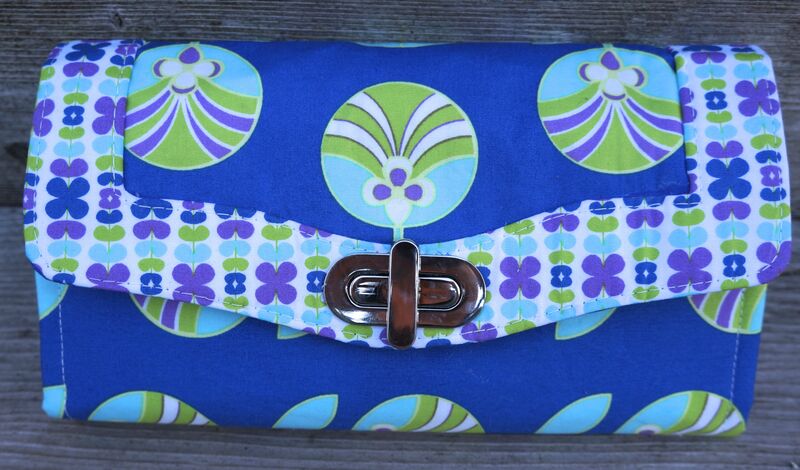 Great clutch – I think I will need to buy this pattern! Let me know if you do Tamie, I have a few tips if you have any problems. The clutch flap is tricky. I just found a cute bag for a quarter. So that saved me a ton of time and $$! I am working on a quilt for my nephew. Inspired by Kaffe Fassett’s shirt stripe boxes. Oooo, love Kaffe Fassett’s fabrics and quilts, yours sounds like it’s going to be gorgeous! love it, especially the closure. Nice bag – love the fabrics. I’ve just bought some of those. I love the fabrics too, fun without being silly, fresh for spring and summer! This little clutch is a winner. You sure are a production house all by yourself. I have made dozens and dozens of various types of bags over the past 20+ years (most of my own design), but I’ve never seen anything like this! You did a superb job! I LOVE the hardware. Went to Emmaline’s site and even though she sells a hardware kit for this bag, it does not include the twist closure. I’ll have to contact her about it. You really knock me out with your creativity and your workmanship!! Oftentimes, a person will have one or the other, but you have both. Congrats. Hi Andrea, the twist closures are on their way and should be in the shop soon! Janelle from Emmaline. Love this. I wonder how to get a discount code to buy the pattern.